A caribou with magnificent antlers, out on a wintry, snowy day, looking straight into the camera. Caribou, also called reindeer, by you and me :-) is a species of deer native to Arctic and Subarctic regions. Every year as summer approaches, caribou herds head north to the tundra. 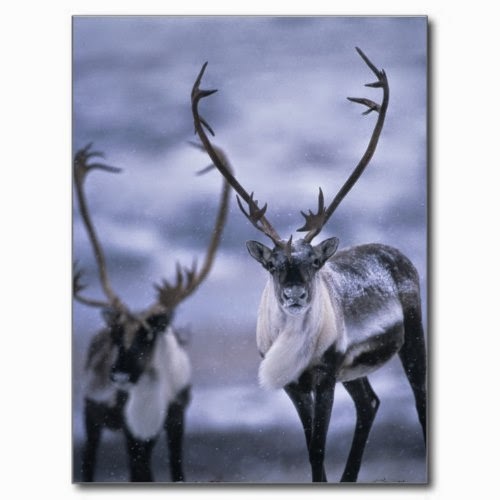 And when the first snows fall, the caribou head back south, completing a migration that sees them travel as many as 1,600 miles (2,574 kilometers) each year. This beautiful National Geographic photo, featured here on a photo postcard, was taken at the start of one such migration to the south, as the weather became cooler. Photographed by Paul Nicklen.